It is estimated that more than 100 million people collected the Washington State Quarters. The primary objective of this book is to help families and young collectors to take the next step in actively collecting and enjoying the incredible world of coins. This book presents several innovative ideas for attracting and retaining new collectors, insuring that the coin shows and meetings are family friendly and kid friendly. Read proven methods from several creative leaders of our hobby. Coins can be a great way for parents to connect with their children and share a common hobby. In addition, coins are a great teaching and learning tool for many different subjects such as art, history, math, and science. They can be very helpful in developing and building basic life skills such as goal setting, patience, responsibility, socialization, and becoming detail oriented. 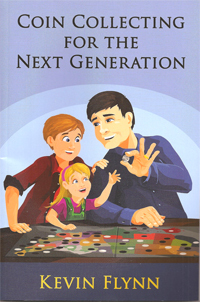 This book provides helpful hints for parents getting their kids involved in coin collecting. Taking the next step may include taking kids to coin shows. Learn the difference between large and small shows, what to expect, and how to prepare kids for shows. The book includes articles written by some of the leading dealers, club and show organizers, and collectors in the hobby. From their experiences. These experts have presented some great ideas for getting kids involved in coin collecting and how to retain their interest. The Coinage of William Wood 1722-1733 By Philip Nelson M.D.